Today I get to reveal our very special Guest Designer for our January - Tracy Gruber! I'm super excited to have Tracy as our guest this month - she has such a fun style of card-making with fun layouts and awesome coloring skills! Tracy will be posting with our Design Team starting with our January release reveals next week! Here's some more about Tracy in her own words - Make sure to check out her blog and say hello! I'm Tracy and I am a 24 year old college student. I graduated in May of 2012 with a Psychology degree and now I'm back in school going for a Graphic Design degree. I have been creating for as long as I can remember, doing projects with beads, paper, string, glue, you name it! Now I love to make cards using fun techniques and stamps! 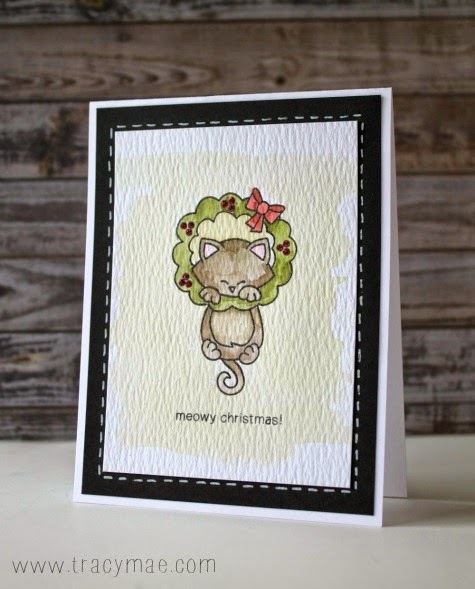 Here's a card that Tracy created using our Newton's Holiday Mischief Stamp set - I love the watercoloring on this card! Can't wait to see what she does with our new release! Beautiful card!! Love the water coloring! Love this card! Congrats on being the guest designer! Look forward to seeing more of your work! Welcome Tracy! Big fan of your work and YT channel. So happy to see you as the Guest Designer and can't wait to see more of your work :)! Beautiful coloring and lovely card! Congrats.